Before we start to describe testing that assess anaerobic endurance, we would like elaborate on the term with regard to a football context. We described that performance in football heavily dependents on the aerobic endurance (or aerobic system). However, in order to be able to perform short burst of high intensity running and or sprinting the anaerobic system is needed heavily as well. Therefore, ALL system work at the same time (9, 13) - see references below. Energy in the anaerobic system is produced through ATP (adenosine triphosphate) without oxygen. This occurs in the cellular plasma in the muscle. As we said earlier ALL systems (aerobic +) anaerobic-(a)lactacid work at the same time. For example, the energy delivery for 30-second maximal efforts was seen to derive from aerobic processes (38%), anaerobic glycolosis (45%) and alactic anaerobic processes (17%) (13). 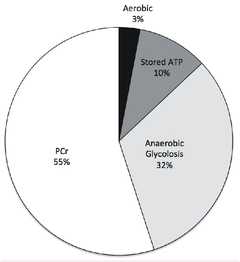 Furthermore, the relative contribution of the anaerobic glycolosis and alactic anaerobic processes was determined as 44% and 50% respectively for maximal efforts with a duration of under 10 seconds (3), see Figure 1 (12). However the intensity (primarily) decides about the energy pathways and not the duration of activity (9). That means that duration and intensity are inverted with each other - The longer the duration the lower the intensity and the other way around. In order to understand the anaerobic system (endurance) in football we need to further describe the two anaerobic pathways. The stores of ATP and PCr in the muscles are very small and the source of energy therefore is only available for 6-10 (max of 15) seconds - This energy pathway is used for sprints and short duration of high(-est) intensity and was seen to depend on fitness level of the player/sprinter (5). Due to the limited substrate availability, the system is supposed to be reloaded (at least incompletely) very quickly, within probably 10 seconds (12) (and we also speculate that the fitness level will also determine the quickness of PCr recovery (2)). The primary energy source in the anaerobic glycolysis derives from glycogen stored in the muscle. Again, due to its availability, the duration to utilize this pathway is limited to 15-45 (maybe 60) seconds. Lactate is the result of the incomplete breakdown of glycogen and can reach values of up to 103.6 mmol/kg dm after repeated sprinting (2). In this context we want to explain that lactate is NOT a limiting factor of performance (nor is it responsible for the “burning” sensation in the muscles), it is a sign of acidosis in the muscle. Furthermore, lactate is a different form of energy and it can be used to restore energy systems. However, due to the presence of hydrogen ions in the muscle, lactate will accumulate as well and therefore be seen as a marker in which the muscle shows a shift in energy delivery (from anaerobic to aerobic system) (1). When maximal accumulation of lactate is exceeded, the lactate will diffuse into the blood circulation (and that is why it is possible to measure it by pricking earlobes). When the intensity (and/or the activity) stops, the liver (and possibly some “non-working” muscles) can restore energy from lactate to pyruvate into glucose which can be again stored and used in the (“working-“)muscle as glycogen. This procedure is called gluconeogenesis. Furthermore, it is also thought that the initial fast phase of PCr resynthesis is dependent on oxygen availability (4, 12). As it seems evident from the paragraphs that the anaerobic endurance is important in intense sequences during football (7). In order to test for anaerobic endurance the intensity needs to be high(est) (14), rest period limited and as a result. In conclusion, anaerobic endurance in football is tested (most of the times) in a repeated sprint set-up (6, 10, 11, 14). Repeated sprint tests also provide data which enables to calculate a fatigue index (14). The fatigue index basically shows the coach how long the player can maintain their highest (sprint) performance (therefore resist fatigue) and as a consequence show the ability to perform during intense sequences during the match. Bioenergetics and its applications. McGraw-Hill, 2004. Fitzsimons, M., and Fournier, P. Muscle phosphocreatine repletion following single and repeated short sprint efforts. Scand. J. Med. Sci. Sports. 7: 206-213, 1997.
metabolism during intermittent maximal exercise. J. Appl. Physiol. 75: 712-719, 1993.
phosphocreatine recovery in exercise-trained humans is dependent on O2 availability. J. Appl. Physiol. 86: 2013-2018, 1999.
high-energy phosphate compounds and lactate accumulation during short supramaximal exercise. Eur. J. Appl. Physiol. O. 56: 253-259, 1987. 6. Impellizzeri, F., Mognini, P., Sassi, A., and Rampinini, E. Validity of a repeated-sprint test for football. Presented at Fifth World Congress on Science and Football, 2005.
metabolites during a soccer game: implications for sprint performance. Med. Sci. Sports. Exerc. 38: 1165-1174, 2006.
sprints. Acta. Kinesiol. Univ. Tartuensis. 4: 122-146, 1999.
ability. J. Sci. Med. Sports. 12: 238-243, 2009. Association soccer. Strength. Cond. J. 30: 70-75, 2008.
repeated-sprint activities:specific to field-based team sports. Sports. Med. 35: 1025-1044, 2005.
trained athletes. Med. Sci. Sports. Exerc. 33: 157-162, 2001. 14. Turner, A., Walker, S., Stembridge, M., Coneyworth, P., Reed, G., Birdsey, L., Barter, P., and Moody, J. 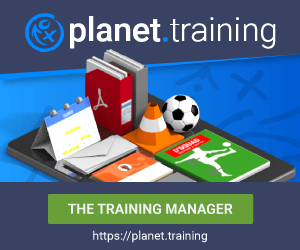 A testing battery for the assessment of fitness in soccer players. Strength. Cond. J. 33: 29-39, 2012.